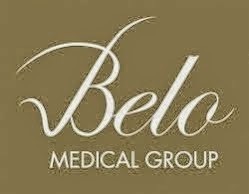 Due to the immense success of the initial broadcast of Ask Dr Belo Livestream Show, the Belo Group will be doing a follow-up of the event. This time around, the show will tackle all about Cosmetic Surgery. This should be the best venue for people out there to have their fears and wrong notions about Cosmetic Surgery. 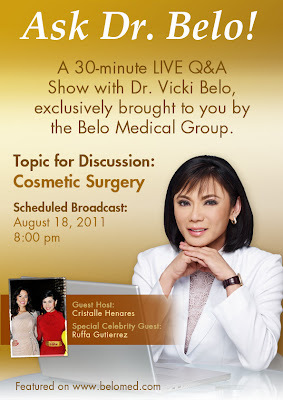 Other than Dr. Belo herself, the livestream show will also be attended by Cristalle Henares & Ruffa Gutierrez. Make sure to tune in and be ready with your Cosmetic Surgery question since the show will only run for 30 minutes. 2. Type in your question/s on the chat box. *Should there be duplication of questions, we will pick the first person who submitted on the chat box! Not only do you have the opportunity to have Dr. Belo answer your question, you also get the chance to win Belo Gift Certificates! So keep posted and tune in. Iba ka talaga Fierce Blogs! I'm going to watch this because of Ruffa! 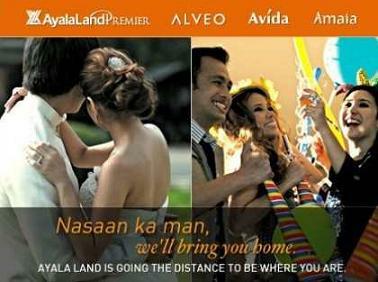 The best Belo endorser! Susan - I joined the 1st livestream! I actually saw Fierce Blogs online as well. Hope to meet the handsome blogger soon! Weee it's back! isip isip na ng questions!